What do we do with people who do wrong? In a culture fuelled by furious online judgment of others, not only those on the hang-'em-and-flog-'em right wing but also those who would place themselves on the liberal left tend towards a fiercely punitive attitude to those guilty of severe transgressions – especially if they appear insufficiently contrite. It's an attitude that makes it much easier, of course, to disregard issues such as conditions within prisons and approaches to rehabilitation; if individuals are deemed to have evil pasts, we don't need to trouble ourselves with their futures. Lou McLoughlan's sensitive documentary resists such dead-end perspectives by extending to an indubitably troubled and troubling individual the sort of compassionate attention he would be deemed by many not to deserve. McLoughlan, an award-winning director of short films, proves herself a consummate storyteller with this first feature-length work, allowing the twists in the film's narrative to reveal themselves gradually, and leaving moral conclusions up to the viewer. And it's a narrative that proves very challenging, despite its bucolic setting and low-key tone. 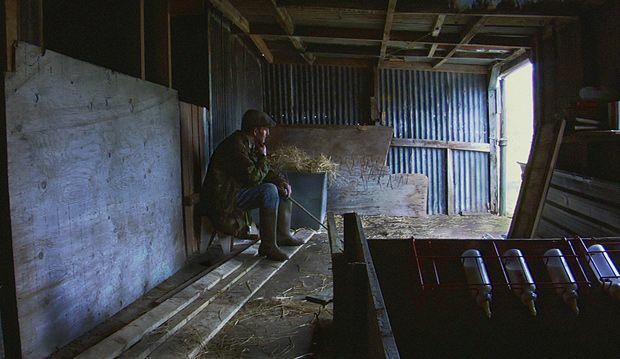 At the start of the film, Uisdean has returned home to his father Calum's Highland farm after a long spell in prison. Uisdean's dream is to set up his own crofting business – but can he shelve his baggage, and keep his bad behaviour in the past? The relationship between the volatile and vulnerable Uisdean and Calum – a stoic, stern, dignified widower who lives surrounded by embroidered Bible verses and seems to have come from an earlier era – is the initial focus, but as matters evolve in unpredictable fashion, Uisdean finds solace and support elsewhere. The viewer is liable to form his or her own views on aspects of the story; this hugely promising filmmaker, admirably, invests her craft in character, and resists forcing an agenda. Screening at cinemas across Scotland from Fri 11 Nov. Sensitive documentary about a man returning to his father's Highland farm after a long spell in prison. Despite the bucolic setting and low-key tone, it's a challenging narrative which resists forcing an agenda and McLoughlan's debut feature reveals her to be a consummate storyteller.